This Saturday once again, international and Israeli activists joined farmers from the Saffa area of Beit Ommar on their land near the settlement of Bat Ayn. For the last two months, farmers have been forced to use Israeli and international accompaniment as they pick grape leaves and tend to their land in order to prevent attack from right-wing extremist settlers. The Israeli military has made it even more difficult by constantly ordering the entire area a closed military zone; an act that is supposed to be used temporarily but which this district commander has used to prevent farmers from accessing their land freely for 2 months, in violation of an Israeli supreme court order. 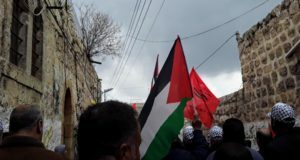 The military, for the second week in a row, selectively enforced the closed military zone against the farmers and solidarity activists while doing nothing to prevent the settlers from moving towards the farmers, screaming insults and rolling boulders down the hillside onto the Palestinian agricultural land. 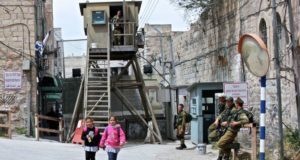 The Israeli army prevents Palestinian farmers to harvest in the Settlers had also obviously been allowed access to land in the last week; several grape vines and fruit trees belonging to Palestinian farmers had been cut down and an area of the privately owned land had been burned. The Israeli military forces and border police quickly forced one group of activists and farmers back into the village less than an hour after the group arrived in the area. Two other groups, accompanying Jabber and Hamad Soleiby, worked on the land for approximately 2 hours before border police arrived and ordered them out of the area, presenting a new closed military zone order covering the next seven days. The Israeli army prevents Palestinian farmers to harves in theWhen an Israeli activist approached the border police to remind them of their obligation under the Israeli Supreme Court order that they were required to allow access by the farmers to their agricultural land, he was arrested. Kobi Snitz, with Anarchists Against the Wall, was held for over 4 hours without an arrest report, in violation of the Israeli police’s own policies. He was then taken to the Qryat Arba police station where the police banned him from the Southern West Bank for 3 days. He was released that afternoon. 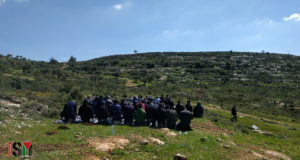 The farmers in Saffa, assisted by PSP and Ta’ayush, are collecting evidence of the violations of the Israeli military in ordering the area a closed military zone in perpetuity, and also of being complicit in settler attacks on farmers and solidarity activists in order to file legal complaints against the ongoing abuses.